Shimofujiya brings you the finest tastes of all four seasons. The Okushiobara region is surrounded by lush verdant nature. It’s from this abundance of nature that we source our vegetables, wild plants, river fish and meat to create cuisine that is truly inspired by the beauty of Japan’s mountainous nature. Delectable, mouth-watering marbled kuroge wagyu beef, a light yet rich and flavorful to die for pork full of umami known as sangenton, locally produced fresh vegetables, and fresh char fish stream farmed locally are just some of the many carefully selected ingredients we use in our expertly hand crafted cuisine. At Shimofujiya we use only the finest carefully selected ingredients for our breakfast. Locally sourced and freshly prepared, we make sure every member of our staff works together as a team so that your meal is presented to you hot and delicious. It’s a taste made for the morning, and just what your body needs. Please enjoy the finest natural ingredients prepared with professional care. Locally farmed and freshly picked vegetables, organic tofu, and a locally produced egg known as the Nasuno Goyou Ran which is creamy yet very healthy making it the utmost premium egg, are just some of the meticulously selected and prepared ingredients we use in our breakfasts. Soft and lean, Sangenton Pork has the ideal balance of richness and umami. 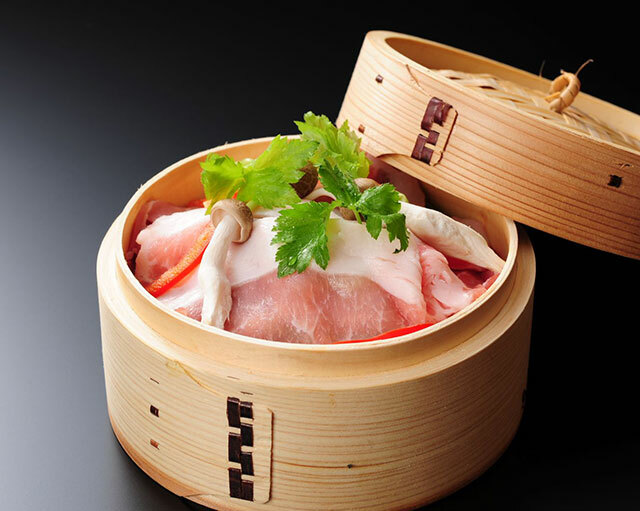 The famous kurobuta species is just one of three species of pork used in creating the Sangenton species which is heralded as the most premium quality of pork in Japan. Raised with meticulous care, and under strict quality control Sangenton Pork is soft, rich, and flavorful without being heavy. After just one bite, we’re sure you’ll become a believer in the exquisite taste of this delectable pork. 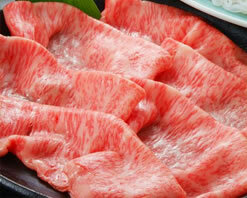 Raised locally in heart of Tochigi Prefecture’s bountiful nature, A5 Rank is the highest level of Japanese beef. The exquisite marbling, melt in your mouth texture and rich flavor make this particular cut of beef an outstanding work of culinary art. Located close to Shimofujiya is a local char fish farm. The fish are raised next to a clear mountain stream making them as close to naturally caught as you can get. Provided with premium quality feed, the result produces a river fish with a firm and delicious texture that we source fresh every day. We believe in supporting the local farming community so for us that means using as many locally sourced ingredients as possible. On top of that we also believe that produce raised in the mountainous nature of the Shiobara area is of the finest quality and taste. Amongst this produce the root vegetables from the Nakashiobara area are of particularly good quality. The daikon produced here is of such good quality that it is annually presented to the royal family. Nasuno Goyou Ran. Super Premium Eggs. A stringently selected mix of seaweed, sagebrush, traditional Chinese herbs and other fine ingredients is fed to these free range chickens allowing them to produce eggs of superior quality. 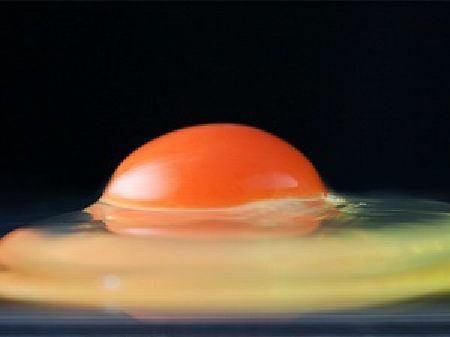 On top of its rich and creamy flavor the deep orange colored yolk is packed full of nutrition. Ranging from 5-10% lower in cholesterol, and high in alkaline, the Nasuno Goyou Ran is as renowned for its health as it is its flavor. The tofu we use here at Shimofujiya is made from organic soybeans using a time honored method that has been around for generations. Soybeans are known for their anti-aging properties, eaten as a diet food, and for promoting good health in general. Enjoy freshly made organic tofu at Shimofujiya every morning. Made with 100% Japanese non GMO soybeans and all natural water our tofu is packed full of proteins and available carbohydrates. We use soy milk with a 12% solid content, and add no preservatives. 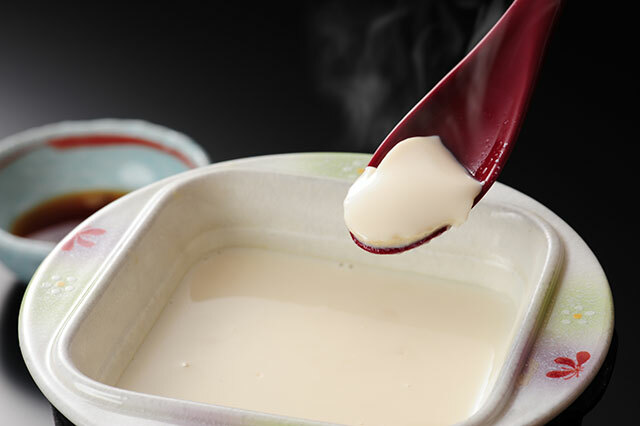 With our original recipe the tofu retains its soybean flavor, shape and nutrition. In addition our low temperature, high pressure pasteurization process gives our tofu a rich creamy flavor. Part of the fun of visiting somewhere is getting yourself acquainted with the foods and flavors of that area. 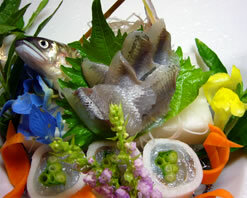 Shiobara has several local delicacies that we hand craft with expert skill into exquisite dishes. Dishes are sold in one person increments. If you’d like to add any of our special dishes to your course meal please make sure to reserve them in advance. 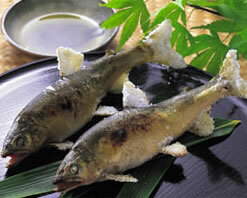 Raised in pristine mountain stream waters a grilled char fish or sweetfish is a classic Japanese delight. Served straight off the grill. Enjoy it while it’s hot. A 2 person serving is pictured. This sashimi is prepared “sugata zukuri” style which means the whole fish is carved into sashimi and served decoratively on the plate appearing as a whole fish once again. 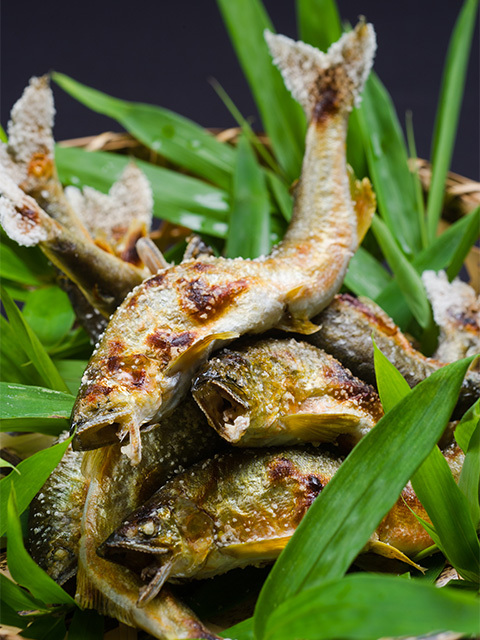 Raised in crystal clear waters, this is a classic example of a delicious Japanese river fish. This sashimi too is prepared “sugata zukuri” style which means you’ll see the entire fish decoratively carved into sashimi on the plate. 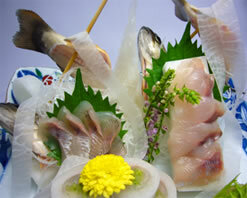 It doesn’t get any fresher than this pristine fresh water fish sashimi. This beloved dish has been a traditional favorite for many generations. 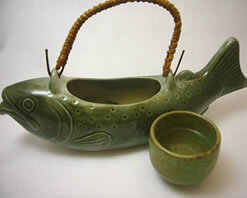 It involves putting a grilled char fish into a fish shaped pot of hot sake to enjoy the flavor the fish imparts into the sake. Once the sake is done you can enjoy the taste of the fish with the last of your remaining sake too. It’s just what you need to warm you up on a cold winter’s day. This dish, though beloved in rural mountain areas in Japan, is a little known rarity and as such is one of our signature dishes. 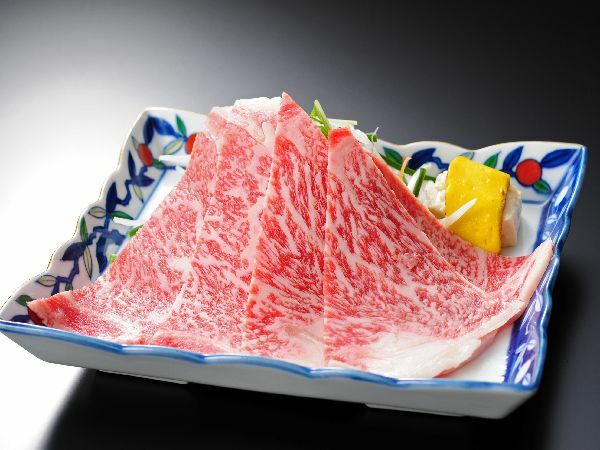 We use premium quality marbled Japanese beef in all of our dishes. 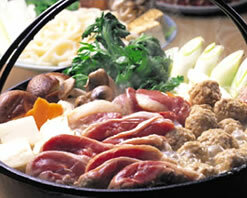 If you’d like to add more meat to your hot pot we recommend this 150g serving. 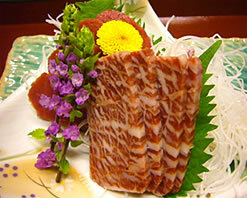 Low in calories but high in nutrition horse sashimi is a beloved part of Japanese cuisine. This savory soup is complimented by fresh locally farmed vegetables to make a dish that is deeply satisfying, and guaranteed to warm you up! Reservation required for this dish. At Shimofujiya we serve Japanese sake in two traditional yet rare ways we think you’ll really enjoy. 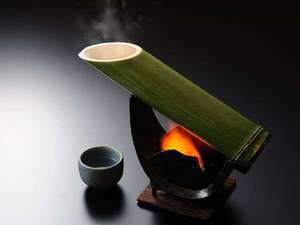 Hot sake is widely appreciated during the colder months in Japan but when it’s served in bamboo over a flame the faint taste the bamboo adds makes it all the more special. 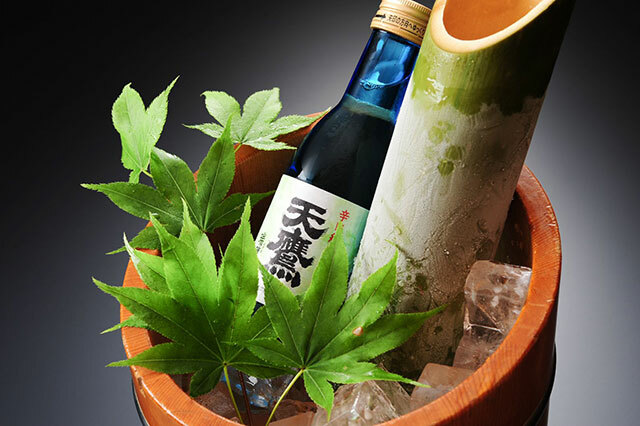 Ice cold sake is a great way to cool down in the hot summer months especially when it’s served in decorative bamboo that imparts a slight aroma that adds to the taste experience. If you have an allergies or can’t eat certain foods due to religious reasons please notify us well in advance. Though we will try our best please note will not always be able to accommodate special requests.